When one thinks of Hong Kong, the two things that come to mind immediately are Dim Sum and Kung Fu movies. 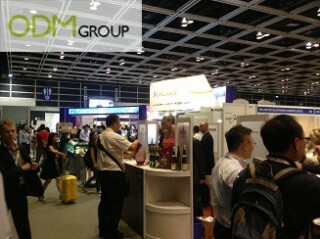 However, Hong Kong also has a lot of international trade fairs such as the highly anticipated Restaurant and Bar Show. It is home to more than 360 booths; offering thousands of different varieties of food and beverage products from all over the world. Our ODMgroup Hong Kong office sent a team down to be a part of this warm and exciting event. It was a busy start to Day 1 of the Restaurant and Bar Show with thousands of visitors, but we are expecting the bulk of the crowd to come in from Day 2 onwards. Why did we like this show? 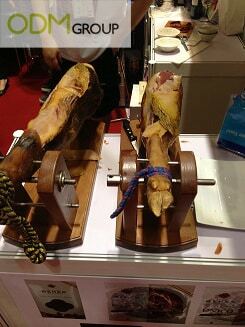 Our team spotted a lot of interesting products during this Restaurant and Bar Show. Just take a look at this Spanish Ham cutting tray! Now that’s something you don’t get to see every day in HK, right? 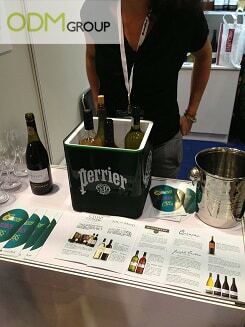 Check out this posh looking wine bucket from Perrier we spotted at the Restaurant and Bar Trade Show! Coated with a lavish green smooth finish, it doesn’t only look simple and beautiful; it doesn’t compromise on practicality as well. It can hold up to 6 bottles of wine, and its square shape makes it easy for it to be carried around. We also found a lot of very famous wine and spirits brands (for example Mouton Cadet). Overall, we felt that the Restaurant and Bar Show is perfect for anyone who loves good food and wines. So why not make your way down to catch Day 2 and Day 3 of the most anticipated Trade Show event of the year in the Hong Kong F&B industry.